Yes, you read that right! I had been awake for almost an hour, what I can't show is the *&^%$#@ racket made by a nest of baby birds in the stove vent. Yes, the stove vent!!!!!!!!!! My dear darling husband better hope they fly the coop by the time he gets back tomorrow or he is evicting the family. And just let those PETA people come here. The same ones who criticized the President for swatting a fly. They haven't met this chick at 5:05AM awakened by some hungry birds. 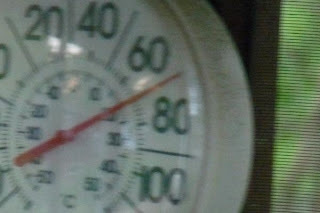 Sooooo, since I had the aforementioned mess at the front door and the temps were mild at DAWN, I decided to tackle it before it got to the projected 98 degrees today. 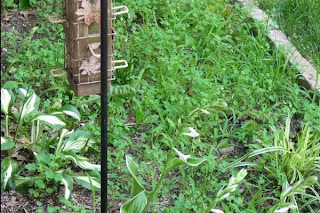 Glad I did and the recycle people have taken the entire bag of weeds that I evicted. I was practicing for birds. Onto the task at hand, shell stitch hem. As always you can click the picture to enlarge it. And there are LOTS of pictures. 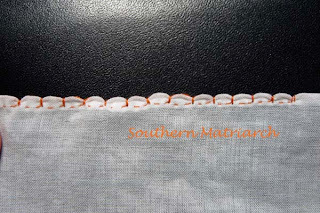 Shell stitch is a way of doing a hand hem that gives a sweet decorative edge. Usually seen around the neck or armholes of a garment. 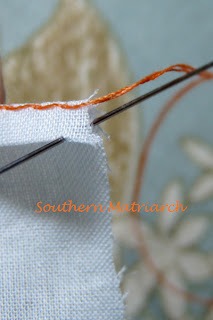 Often using a 1/4" hem. 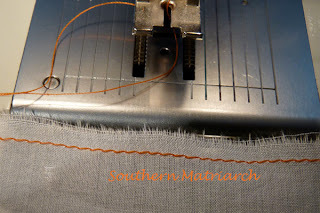 I don't like to take to time to measure so I run a "cheater" stitching line on the machine. 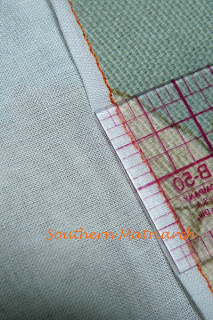 Another benefit of this is, it acts like stay stitching since you will most likely be hemming curves. I used contrasting thread so you can see. 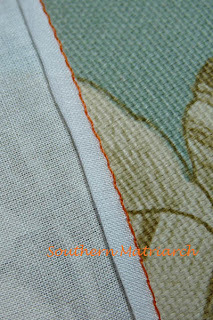 I used a stitch length of 2.6 on my machine. My completed line of cheater stitch. 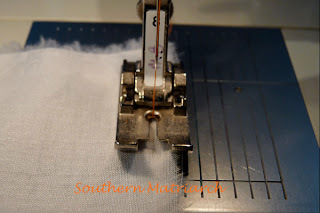 Your finished hem will be 1/8" in depth so you have to fold your hem allowance over twice. This shows the first fold. 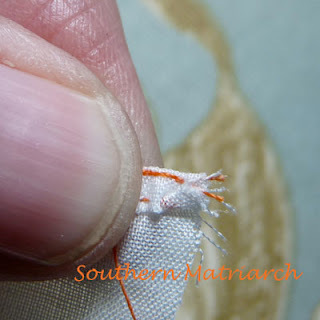 gives you a finished hem of 1/8" at the 1/4" mark. I just finger pressed this since it is 100% cotton. 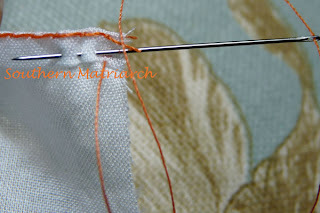 Again using a contrasting thread with a #10 sharp, I bury my thread knot in the fold. 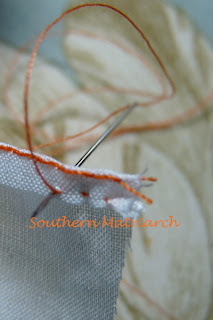 You are stitching from the left to the right on the wrong side of the fabric. Take two running stitching just above the fold. 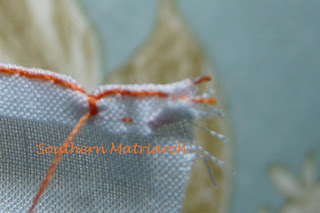 Since I can see my machine stitches so well, I used them as a guide. I have decided I may continue to do this. It makes for even shells. I like that. And I don't have to try and keep it even. I have a guide right there. See I learned something new while trying to share a stitch with you. Cool huh? My guide was 2 machine stitches for each shell. This will make the "dimple" that will form your shells. 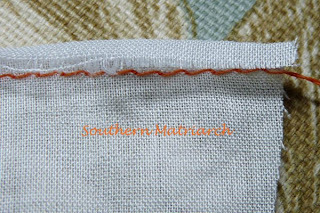 Take a second overcast stitch at the same place. 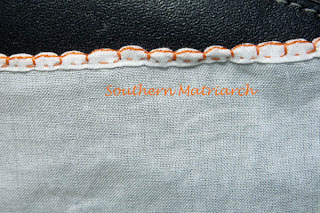 All shells are made up of two running stitches followed by two overcast stitches. Your second shell. Again 2 running stitches followed by 2 overcast stitches. I fold over as I go. 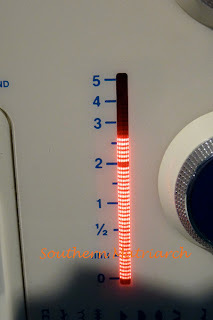 Don't try and finger press the entire length that you are going to shell stitch. You will just drive yourself crazy trying to keep it folded. Finger press a bit, stitch, finger press a bit, stitch. As you tug your shells, your cheater line will gravitate towards the back. Ignore it. 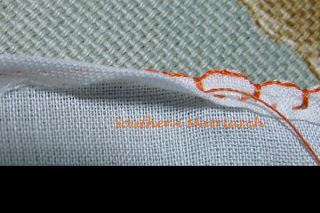 This is a row of shell stitches. You can see I was getting in a rhythm as I went along. the last four on the left are all the same size and depth. So what is the moral of that? Start your shells under the arm, not dead on center front. By the time you get to the neckline center front you will be in the zone and they will look like nice even little shells. Shell hem from the front. 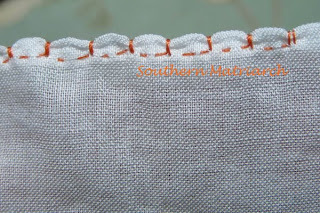 After the shell stitch hemming is complete, remove your cheater thread. 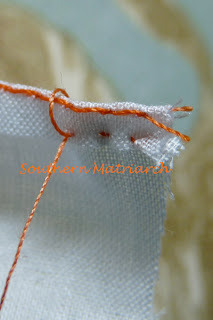 Removing that thread removes the evidence that you don't have "ruler- vision" and it also makes the edge much softer. Voila! 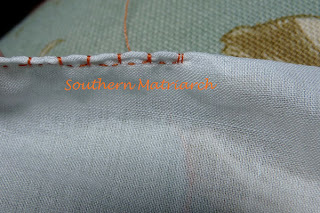 Your completed shell stitched hem. Since you won't have people with magnifiers up around your or your baby's armpits no one will never even notice the stitches used to make the hem. Enjoy and I hope it was helpful. Next up, hand made buttonholes. Your baby gown is so beautiful. How wonderful it will be passed down and, hopefully, the story of who made it with it. Thanks for the hemming tutorial. Thank you and you are most welcome Lisa. I hope it helps you. Thanks for the great tutorial. 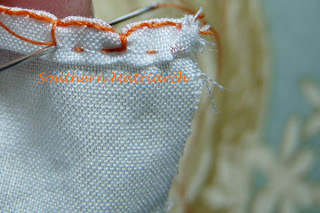 I love the look of shell stitching. Do you have a preferred thread? That is one dumbass bird. 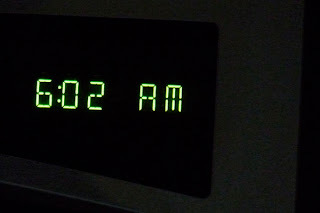 Everyone knows to not wake up the Mar-E-Mar! Love the tutorial. On to doing it for the first time. Laughing so hard about the birds and your pictures! I love doing this stitch. . . although I have a lot of practice ahead to get it right. It's amazing what a needle and thread can do. And I can remember a doll's dress my aunt did for me 50 years ago . . .I always wondered how she did a certain effect and this is it! I have just finished a shell stitch hem for the first time ever on a size two little slip for my granddaughter. It took me 5 hours to do the neck and armhole edges! I wish I had seen your tutorial before I started doing it! I will definitely bookmark your website. I am returning to smocking and French hand sewing after a 25 year absence with the birth of this little girl! Thank you.